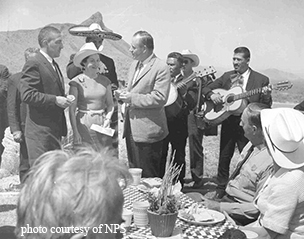 Fifty years ago, the first lady headed west to promote conservation. The purpose of her trip: The first lady wanted to bring attention to the wonders of America’s national parks. What made the trip special: She hiked the Lost Mine Trail, listened to stories around the campfire and shot the rapids of Mariscal Canyon on a raft trip. It became one of Mrs. Johnson’s most celebrated excursions during her White House years. As first lady, Mrs. Johnson established herself as one of the nation’s chief proponents of environmental conservation. Using her influence as a resident of the White House, she gave speeches on environmental issues, led the fight against the proliferation of billboards along highways, spurred the beau­tifi­cation of our nation’s capital and pushed her husband to enact environmentally friendly legislation. Some of Mrs. Johnson’s most effective tools in promoting her cause of conservation and beautification were her tours of natural areas. The press corps couldn’t resist tagging along as she visited places such as California’s redwood forests, Wyoming’s Teton Mountains and New York’s Hudson River. Her Big Bend trip took that experience to a whole new level. 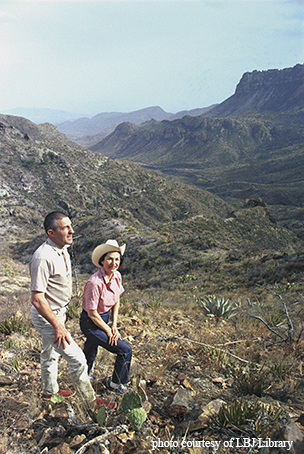 She visited Big Bend National Park — the closest national park to her home and the first national park in Texas — in April 1966 as the National Park Service celebrated its 50th anniversary and marked the culmination of its Mission 66 improvement program. Secretary of the Interior Stewart Udall, press secretary Liz Carpenter, Secret Service staff and several dozen members of the media accompanied her. 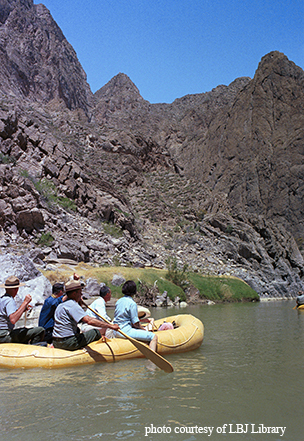 Lady Bird Johnson takes in the scenery as she, Stewart Udall, park staff and others float down the Rio Grande. In her diary, she noted the "great soaring cliffs" and the "sweet call of the canyon wren." The first lady and her entourage flew into Presidio, “known to me only as a place on the map that the weatherman usually reported as the hottest place in the United States,” she wrote in her White House diaries. The afternoon found them in the Chisos Basin, where she noticed two kinds of junipers she had not seen before — weeping juniper and alligator juniper — and she checked in to her cabin. Mrs. Johnson noted the abundant bird life and the marvelous views into Mexico. Everyone took a break at the top of the trail, where she made a few remarks and the photographers snapped some pictures. At the end of the day, everyone gathered on a mesa top for dinner and a roaring campfire. Entertainer Cactus Pryor emceed an evening of folk songs and stories about Comanches, cattlemen and conquistadors. Those in attendance were spellbound by the “magnificent drama proceeding in the sky,” Mrs. Johnson wrote in her diary, as the sunset painted the twilight and a full moon dramatically rose over the mountains. A mariachi band entertains at lunch. The next day, after the first lady planted a pinyon tree, the people on the trip got into cars for the journey down to the Rio Grande, where they would raft through Mariscal Canyon. The 11-mile trip down the river took five hours. Twenty-four rafts with five to six people in each made their way down the wild river. Some rafts flipped in the rapids. Mrs. Johnson (who took a turn paddling) recalled seeing one man clinging to a rock in the rushing water (he apparently found his way to safety). With more than 100 people floating, laughing, yelling and occasionally falling out of rafts, it was a spectacle the Big Bend had rarely seen. The raft trip also had moments that showcased nature’s majesty and intimacy. “The country was marked with great soaring cliffs that rose up on each side like giant pipe organs or cathedral spires, battlements of some long-ago civilization, or the vast escarpments of another world in which the dinosaurs might still be living,” the first lady wrote in her diary. “Sometimes you would even see a cave. Occasionally, in just a cupful of soil on the cliffside, a cactus would be growing. The trip was a great success. It garnered positive press coverage across the country, and Mrs. Johnson accomplished her goal of showcasing the majestic beauty of a wild and remote national park. For the press, being able to show the first lady rafting down the rapids on a wilderness river sure beat covering the latest bill signing. For Mrs. Johnson, it was one more step in her effort to promote America’s parks and beautification. The environment may not be the first thing people associate with Lyndon Johnson, but he proved to be one of America’s top conservation presidents, along with Theodore Roosevelt and Franklin Roosevelt. Interior Secretary Stewart Udall and Lady Bird Johnson lead members of the press on the Lost Mine hike. More than 300 laws related to the environment were passed during the Johnson administration, forming the legal basis of the modern environmental movement. Many of those achievements are credited to Mrs. Johnson’s efforts. In addition to the expansion of the national park system, major legislative initia­tives during the Johnson admin­istration include the Wilderness Act, the Land and Water Conservation Fund, the Endangered Species Act, the Wild and Scenic Rivers Act, the National Historic Preservation Act, the Highway Beautification Act and the Clean Air Act. Even after leaving office, the Johnsons weren’t finished helping national parks. They donated their famous Hill Country ranch to the National Park Service as a national historical park. “What more can you say than to give your beloved ranch to the National Park Service as kind of a final contribution to the parks?” Whitlock asks. Consider making a side trip to the ranch, near Johnson City, on your next trip out to Big Bend as you celebrate the 100th anniversary of national parks.